My Grandma always reads the newspaper from front to back, every article, so nothing slips her attention. If she sees something that she knows I’m interested in, she’ll either sit it in front of my chair at the kitchen table, which is next to the high chair of course, or if I’m already in the kitchen she’ll tell me about it. There was an article in the paper the other day about a firefighter that is fighting a battle of a different kind. A battle she and I are quite familiar with in our family. He has stage 4 colon cancer and has been fighting it for over a year now. The newspaper went on to say what a year he’s had with this cancer. The doctors have removed 75% of the tumors and he has been on chemo. He says that he plans to go back to work for the Fire Department at the end of the year. His church had a silent auction yesterday and all the proceeds went to him. Grandma and I decided to go see what all they had. There were many craft items that caught her attention, especially this one quilt. She got to talking to the lady who handmade it herself. 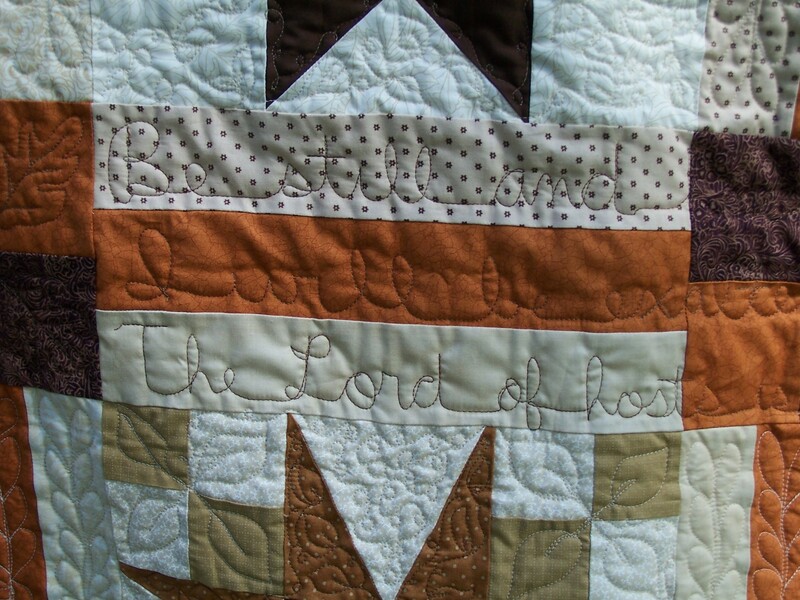 She had sewn bible scriptures in it and it was adorned in fall colors (my favorite colors). It was beautiful to see in person as it was the first item you would see when you walked in the room. I pushed my daughter around the room, looking at the other items. There were several jewelry pieces, a few wreaths, a vase, photo frames with gift certificates, there was a gift certificate to a cake decorating place, many paintings, and a few other gift certificates. I bid on a Mary Kay basket I saw. The thing about a silent auction is, you write your name and number down on a piece of paper and how much you bid. You never know who will come behind you and write their name down and place a higher bid, outbidding you. I was surprised though when I was called the next day and told that I won my item. Not only that, but I had won the quilt my grandmother was looking at thoroughly all night. She and I had both put our names in the raffle. I’m really proud of that quilt and so is she. 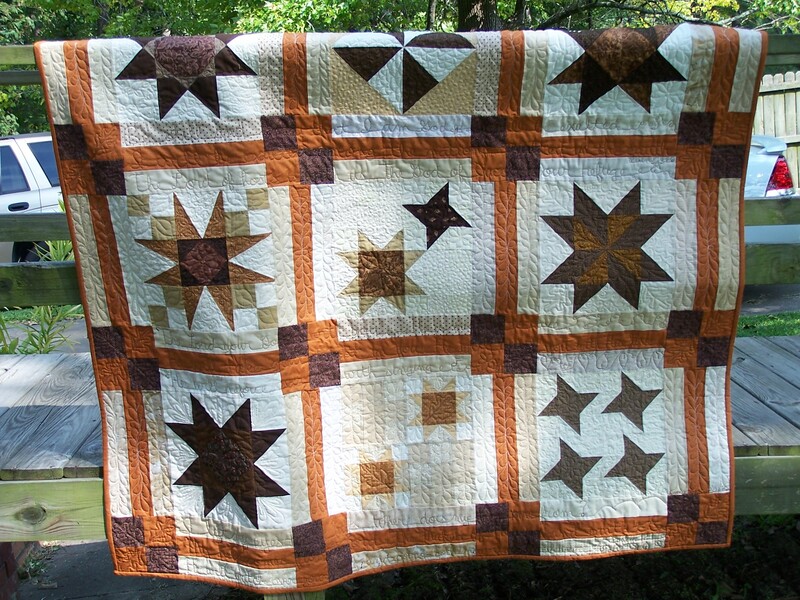 The lady who made the quilt was the one who dropped it off. Both Grandma and I had to tell her we loved the quilt. She asked us if we knew the firefighter, Gavin Wright, and if that was why we were at the silent auction. Grandma said no, neither of us knew him. Both, she and I, have a place in our hearts for firefighters and always will. Grandma’s husband, my grandpa was a firefighter. He and a few others started the Bryant Fire Department. He retired from the Fire Department in 1997. I had a little hand in firefighting when I was in the Navy. I also have friends and relatives on the Fire Department. Every year around the holidays my Grandma and I make a huge container of homemade baked goodies and take over to the Fire Department. She has really appreciated their help during the time my Grandpa was sick. It makes their day to get homemade goodies when they’re at work, instead of spending the holidays with their family. This entry was posted in Blog and tagged autumn, bible scriptures, cancer, church, fire department, firefighter, fireman, Gavin Wright, grandparents, holidays, Mary Kay, military, Navy, quilting, quilts, silent auction on September 25, 2012 by JenniferNAdams. Thank you for stopping by! 🙂 Not much effort in writing at the moment. Thank you! This is a free blog site. I chose from a list of themes that were already made.